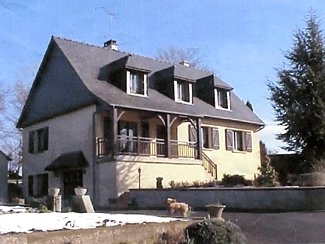 This large detached house (situated in the beautiful French countryside) has a modern open swimming pool and a 1 acre lawn. The house has 5 bedrooms and sleeps 10 people; namely 3 twin rooms upstairs and 2 double bedroom downstairs. One bedroom has a king size bed.It is especially suited for 2 small families. * Bedroom 1: king size downstairs. * Bedroom 2: double downstairs. * Bedroom 3: twin upstairs room. * Bedroom 4: twin upstairs room. * Bedroom 5: twin upstairs room. * Shower and toilet upstairs. * Shower, W.C and bathroom downstairs. 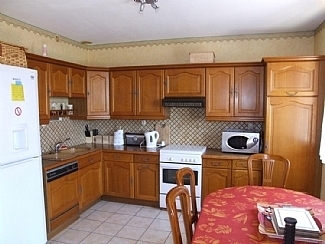 Other features include central heating, a log fire and Sky TV; along with a cooker, freezer, microwave. Fridge American type,Washing machine and tumble dryer. The lawn contains a Barbecue and boules area. 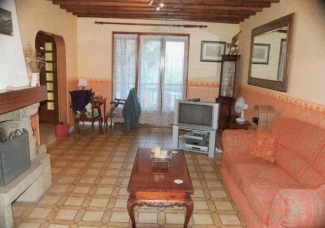 This house is situated between 2 villages located 2.5km away in each direction, both of which have their own caf�, restaurant, bakery and butchers. Our nearest neighbour is 300 yards away.